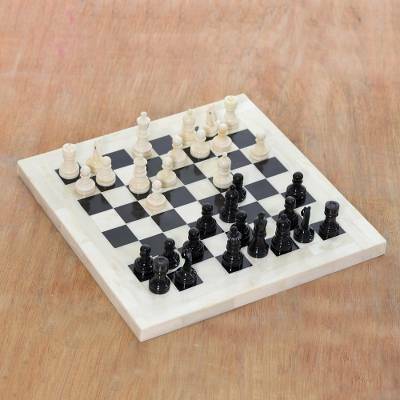 Handmade Bone and Horn Chess Set from India, "Royal Victory"
Invite the game of royalty into your home with this chess set from India. Umair Qureshi designs the chess set, carving each piece from ivory-hued bone and black horn. The pieces are played on top of a handmade board with a frame of bone. Completing the set, a handy travel box with a handle features a space for the board and a tray for the pieces. "I use bone, horn and resin to make my carvings... It's fascinating how each piece has a unique form and color. This happens because of the nature of the materials." "I was born and raised in New Delhi. But, as a child, I accompanied my father to his village every weekend and was fascinated by the bone work done the artisans there. In his time, my grandfather was a celebrated bone carver himself and we had a ritual after each of my visits to the village. I'd tell him all about what I'd done. He would teach me tricks, gave me tips and bequeathed me his tools. "I forgot about carving when I was in college studying business economics, but I visited my father's village again during my senior year and it reignited my passion for this craft. With a staunch belief that I had found my calling, I moved to the village as soon as I finished college. There, I began working alongside artisans who taught me this art. "After returning to Delhi, I started working with some help from my father. The work was slow at first but, with my family's support, I persevered and succeeded. With the flame in my heart going strong, I began creating more intricate designs. Since then, I've continued to learn new techniques and methods while perfecting the old ones. "I use bone, horn and resin and I believe that an item is as good as its material. It's fascinating how each piece has a unique form and color. This happens because of the nature of the materials, which makes me even more excited about my work. "I often seek help from the artisans in my village and share designs with them. We've learned to work as a community. My goal is to spread the arts of our community far and wide. In this way I can help artisans who are still being exploited."